our wines are available online for shipping to some states. upon clicking the links below, you will be redirected to our shopping cart at the bellwether hard cider website. Kaffir lime, green apple, wet slate and gun flint on the nose carrying onto the textured palate with brioche and chalky minerality. This wine had a two week ferment with AMH yeast, peaking at 70 degrees. The wine then rested on the lees for 6 months, with battonage (hand-stirring of the lees) every Friday. This wine was kept under pressure throughout elevage. No SO2 was added at this time. After 6 months the wine was racked and so2 was added. After being fined with bentonite, the wine was filtered and bottled. These grapes were field sorted and hand picked from A&D Vineyard, which lies within the bluff of Keuka Lake. Ambient fermentation with no fining or filtering. This creates a continually evolving nose with lime, white flowers, and earth. The palate has a slight effervescence with a mineral core, accompanied by green apple and lime. This was a five month fermentation with ambient yeast. During the fermentation, battonage (hand-stirring the lees) was performed to maintain a healthy fermentation. No fining or filtering was performed. Small SO2 addition before bottling (50 parts total). Tuller Vineyard is located on the West side of Seneca Lake. This wine is allowed to spontaneously ferment with ambient yeasts. A touch of residual sugar brings this off-dry wine into balance. Seven Sisters Vineyard is located on the East side of Seneca Lake. This semi-dry wine was hand-picked and gently pressed before going through a long, cool fermentation. Flavors and aromas of stone fruit give way to a long, honeyed finish. Our Pinot Noir was hand picked from Sawmill Creek Vineyard on the East side of Seneca Lake. The grapes were hand sorted and fermented with 35% whole clusters. The wine spent nine months maturing in French oak prior to bottling. Sawmill Creek Vineyard is located on the east side of Seneca Lake. *Our 2013 Pinot Noir is not available for purchase online due to extremely limited quantities. 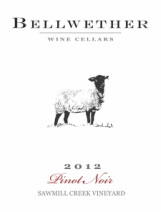 If you are interesting in purchasing some, please email kris@bellwetherwinecellars.com.